Hi all - i'm lurking in the 997 forums again as I am contemplating a daily driver. I have a budget around 20k, based on the current market, brings me into private sales of early cars 2004-5 with (typically) higher mileage (80k+). What sort of maintenance expectations outside of the normal schedules should I have at this level? are there commons failures (outside of engine/bore scope inspections) at this age and mileage that I should look out for? This should help me narrow down any candidates before I hone into something I like and eventually pay for an inspection. As cars get older all mechanical items will require replacement. 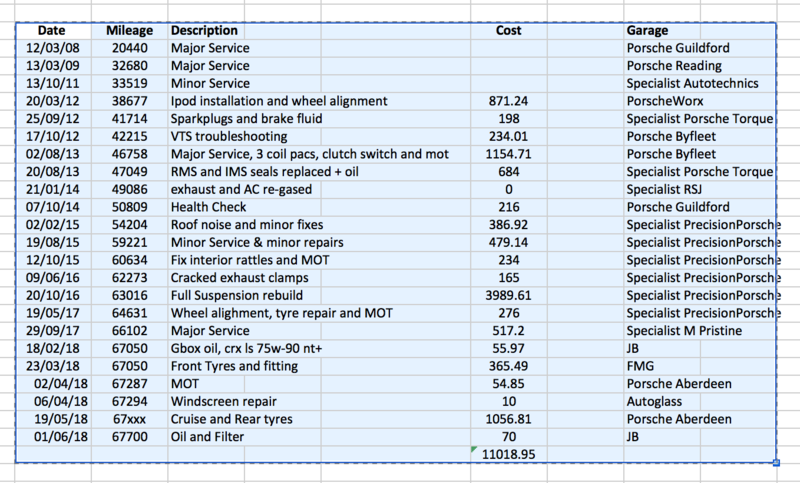 Unfortunately the only accurate check list for older and/or high mileage cars would need to include everything as some parts will have already been replaced. So much depends also on the type of use - ( eg. many high mileage cars will have clocked up motorway miles so some parts won't be as worn as those that have been use for more general use) and how well the car has been maintained during its life. Many high mileage cars far better service histories showing more regular oil changes etc than low mileage cars. It's a simple fact (in the UK especially) that high mileage cars are worth considerably less than average mileage and low mileage cars regardless of their type of use and maintenance records. If your budget is tight you may well find a real bargain. I don't think there's anything wrong with buying a high miler as long as it's got a big wodge of paperwork with it. If I see the previous owner has owned it for several years and hasn't skimped on the maintenance then I'd feel a lot happier about it. Ive been helping a friend of mine look for a late 996 or an early 997 .. to be honest at £20k which is also his budget the 997 cars have all needed a fair bit of work done to get them back upto spec. Basically you are really at the bottom end of the 997 . To give you an idea though on what ive seen with my friends possible buys ..
Shocks corroded , top mounts worn. To be fair this is a coastal car though . they suffer more . Exhaust silencer seams splitting .. flange bolts , clamps all heavily corroded . Thats just some of the normal issues im afraid. For me i would say look at a late 996 .. idealy a 996 C4s .. or increase the budget a bit as unless you get lucky you will be buying a car that needs a fair bit spent on it to bring it back to life . I'm definitely not discounting 996 C4S but 20k seems to be lower on the budget there based on my research. I do have one 997 trade prospect in mind that seems to be 2-3k lower than trade retail (based on feedback from my dealer contact) so i'm investigating more there. Deciding whether OPC inspection is worth the money or using a specialist mechanic or PPI nearer the south east London/Kent areas. I think the only thing lower mileage reflects on a 997 is a higher asking price. My car has just rolled around to 40k miles and I am in the middle of replacing all four discs and associated pipework, all 4 coffin arms, track control arms, ARB bushes and mounts, all the drop links, rebuilding all four calipers and all new Porsche fasteners. I had a precautionary clutch change at 38k miles as it was feeling heavy , IMS seal and RMS, three oil and filter changes in 1500 miles, I have a good supplier ! I have identified my rear cooling pipes will need doing, treated for now as car is SORN until next April, as stated its engine out which normally I would do myself but for various reasons I cant do it at the moment, its a job I have been quoted £1200 to do. I’m pulling the front struts shortly to replace the top mounts and washers, have the strut bodies blasted and painted. Thats at 40k miles, some is for vanity purposes, some is pre-emptive and some work was required, I’m also happy to do the spannering work. I think what I am saying is higher mileage may not necessarily mean worn out as lots of parts may already have been replaced. As a contrast my wifes 986 has 105k miles, I dont look under it, we get in it and drive it, its never let us down once, my mrs drives it everyday even in the snow last winter, uses no oil or water and took us to Salzburg and back in summer. The key is finding a high miles car that's had the work done... as shown by Ruddy above, a lot of maintenance is condition/time, not mileage based. Obviously it will be a high miles car, so expect it to fetch comparatively less when you come to sell. Other things to watch for other than already stated- paint corrosion, underbody corrosion (as it will likely have been used all year round, more stone chips to rust etc). Trim damage (particularly on 997s- 'melting' buttons). Chipped windscreen, headlights. As well as a borescope, if I had my time again I would want an oil sample for analysis- may give an early steer on bearing wear etc. FWIW my '05 Carrera S is coming up to 80k miles. New Eibach springs, top mounts, frt and rr coffins, good Michelin tyres, complete set of coolant pipes, newish rads and condensers, new air -con compressor and pipes, new tandem pump, water pump and loads more. She's not for sale, but if she was my asking price would be backed up by all the invoices. Did Porsche make any subtle updates through the 997.1 years? I can tell you from personal experience (my budget is the same) that you may struggle to find good cars that don't need things doing. I've just done my fourth Pre Purchase Inspection and have had to walk away from that car as well. From what I have seen, corrosion is a major issue. This includes brake pipes, coolant pipes, shock absorbers, chassis legs and brake discs. And (apart from the brakes, comparatively speaking) this will all cost you quite a bit of money. From the cars I've looked at, the 997s seemed to suffer more from corrosion than the 996s, but it has a lot to do with whether the car was garaged, lived by the sea, etc. Fortunately, these are things that can actually been seen fairly easily even if you're not mechanically gifted so long as you can get underneath the car. The biggest 'subtle update' Porsche did with the 997.1 was change the IMS bearing for the 06 model year. You can find out whether a car has the updated, less failure prone IMS by comparing the engine number with data on here and elsewhere online. Just use the search. Be aware though, that the newer IMS in 06 model year 997s is not as easily replaced as the one in the 996 and early 997 (it's basically the same part). In fact, I'm not sure you can replace it at all without splitting the engine. There will be debate about this, but the newer IMS is apparently better. All 997s can suffer from bore score. But one specialist put it to me this way: "less than 10% of my customers who drive 997s are on the forums." But it's on the forums you'll find the ones that scream the loudest about the engine issues. Bore score isn't as sudden and catastrophic as IMS failure, and (if it was me) fit a low temp thermostat and use a slightly thicker oil and be happy. The good deMort (who's helped me out a great deal and to whom I am eternally grateful) also suggested that if you look at a car, make sure it's started in front of you from cold. If there's smoke from the exhaust, walk away. The 997 you're considering in the South East doesn't happen to be a black one, does it? Some good chat there. I'm more of a high miles guy, although I wouldn't describe 70k miles as super high. It's less than 7k/year. I don't mind sharing my car's history, it's a 2007 T4S with X51. It uses next to no oil, dropped one cube over 4,000miles this year on the dash check. Winter jobs are getting the wheels reburbished, just a bit of corrosion and few very minor scratches. Maybe also get the steering wheel leather recovered, but couldn't remove it last year. In the last year I've put tyres on, fitted cruise and changed the box oil and engine oil. Not really things going wrong. It's almost time to put it away for winter, road are already being gritted in Aberdeen, but will tax it one more month for those nice winter days. That's me one year in and the 997 is epic fun, what a noise and brill looks. Best buy ever. I think you're better buying older cars with high miles because they've been maintained. I thought even sound 911s sometimes do that as a result of oil sitting in the flat cylinder bores? A puff of smoke when started after over night stop is normal .. more than that isnt. You also have to wonder if a car is warm when you go to look at it .. Why ? Sorry to jump in on this thread but I was just wondering if it is possible to contact OPC to get an itemised list of things that have been done to a Porsche over its life, obviously from OPC servicing. I have a 2008 997.1 with 104k on. It has been under OPC warranty all its life (just ran out OCT 2018) as far as I know and has full OPC history. It only came with the stamped up book and the last service report from January 2018, so I bought it with some degree of confidence. It would just be interesting to get a little more of an in depth report in case I want to sell in the future and maybe interesting to know for potential Porsche buyers. Yes. Service departments are usually very helpful with this. Most will provide more detail if you pop in to speak to them instead of asking over phone. You should be able to get info on warranty work but not many will release detailed general non-warranty work as the invoices have the owners info on. You might need to contact each OPC If the car has been serviced at a few. Not all are able to see each other’s records surprisingly. I believe most will not issue information since the data protection law came into effect earlier this year although this can vary depending on who answers the phone. I know my local OPC very well, I still had to sign a disclaimer allowing them permision to send me deals/offers to my email address ! I’m sure plenty of us have experienced the cloud of smoke. Parking across a gradient seems to help cause it. Certainly not terminal. In most cases with OPCs you would have to seek written confirmation from the previous owner to release any service records or data in their name. This is what I have found with Tonbridge. What they did confirm for me over the phone is the car was serviced at their location between x and y years and verify mileage. Of course you may find a friendly face who wavers from that view. Why would you say that? Do you have knowledge on a specific car?